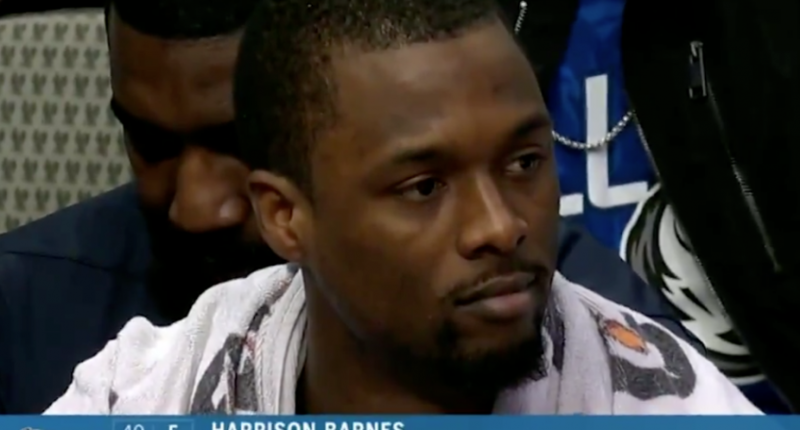 Harrison Barnes sat on the Mavs bench as reports came in that he was traded. Apparently, people in the stands were equally as confused about the awkward situation. Throughout the ordeal – whether he knew about the trade or not – Barnes remained a pro. Harrison Barnes has watched the entire fourth quarter from the Mavs’ bench and supported his soon-to-be former teammates. After the game, the 26-year-old, clearly informed of the deal, got the chance to say goodbye to fans and Mavs staff. Barnes getting traded mid-game is a tough situation for all involved. At least he got to finish out the game, unlike former Montreal Canadiens forward Mike Cammalleri, who famously was pulled mid-game after getting dealt. If Barnes did know about the deal, maybe he used his time on the bench to take everything in one last time before heading to Sacramento. Regardless, it’s an odd ending to what was once a promising relationship between Barnes and Mavericks.